Students entering grades 2 through 12 who are looking for engaging, hands-on ways to explore their interests and career options this summer can now register for Northern Illinois University’s 2017 summer camps. Day and residential camps run throughout June, July and August. The schedule includes both time-tested favorites and exciting new offerings from programs across the NIU community. With options in science and technology, visual arts, music performance, theater, TV broadcasting and sports, every young learner will definitely find something to spark their interest. A full schedule is available online. Log on today to make sure that you reserve a spot for your top choice. Several camps offer both merit- and need-based scholarships. Some camps also offer discounts for early-bird registration, children of NIU employees, returning campers or families who enroll multiple children. Young creative writers, filmmakers and public speakers will be particularly interested in this year’s offerings from the College of Liberal Arts and Sciences. 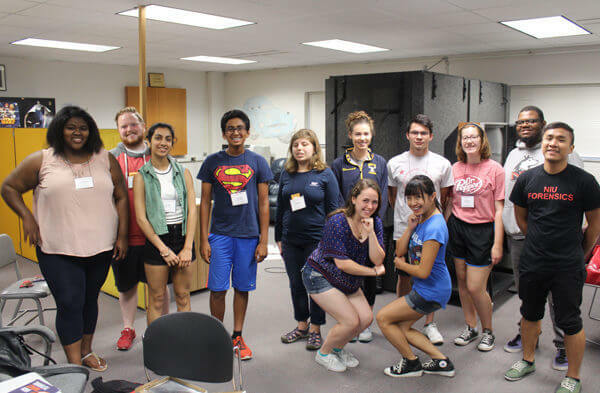 For jazz musicians, stage actors and visual artists, the College of Visual and Performing Arts is offering its usual roster of residential camps that help students polish their art through intensive, daily practice guided by experts. Students looking to explore a passion for science, technology, engineering or math can choose from an array of STEM-related camps. Students entering grades 7-9 can choose from art, chemistry, coding, electricity and magnetism, LEGO Robotics, photography, sci-fi, survival, video games and WaterBotics. Even the youngest students can have a summer STEM experience. The STEM Juniors day camp will offer project-based STEM activities including electrical circuit design and 3D printing for students entering grades 2-5. The STEM Divas day camp includes similar activities with an additional focus on helping female students embrace empowering STEM skills. For students whose primary tech passion lies in video games, NIU’s Digital Convergence Lab offers a series of game design camps with options for all levels of computer coding experience. Students entering grades 10-12 who attend STEM Career Exploration camps get to pick a professional field that interests them the most, whether it’s coding, earth and space sciences, engineering, health, life sciences, physical sciences or video games. Campers will learn about the different jobs in these fields through hands-on experiences. At the Athletic Training and Sports Medicine overnight camp (July 9-12), students learn what it takes to help athletes succeed. “Most students at our Sports Medicine camp go on to study athletic training in college and become certified athletic trainers,” says Sue Hansfield, assistant director of Athletics. A similar professional focus is at the forefront of the Hospitality Leadership Camp (June 14-16) and gives high school students an introduction to the hospitality industry including travel and tourism, the hotel industry, and restaurant and event management. Through work with NIU professors and trips to local restaurants and hotels, campers will learn about this career landscape. Students drawn to the fashion industry from forecasting trends to crafting marketing plans can sign up for the new Fashion Studio Camp (June 27-29) with classes led by NIU’s Fashion Merchandising Faculty. Don’t delay, sign your child up for NIU’s 2017 summer camps!